After returning to Canada from France in 1894, Marc-Aurèle Suzor-Coté set up a studio in Montreal and another in Arthabaska, and announced that he would "specialize in oil and pastel portraits." Suzor-Coté often depicted the habitant people of Quebec, particularly those whose features showed the character of a long life, and in Esdras Cyr, from the generation of pioneers who had cleared the Bois-Francs region and lived in the second concession in Arthabaska, he had the perfect model. Suzor-Coté's friend Renaud Lavergne described Cyr as "truly an authentic old pioneer with a remarkable countenance...the more he spoke, the more Suzor-Coté liked him. The old man used to recount the hard life he had led in his struggle against the forest and the miserable time he had had settling in Sainte-Sophie d'Halifax with nothing to his name but his axe and his courage." Such was Suzor-Coté's fascination with Cyr that he depicted him in charcoal, pastel, oil, etching and sculpture, and some of these works are in museum collections. 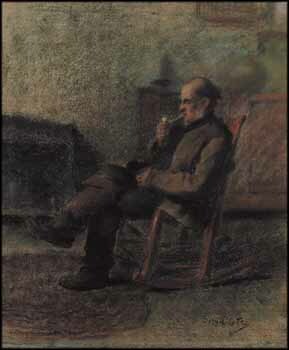 This reflective and atmospheric pastel shows both his mastery of the medium and his great regard for his subject.